Nowadays one and 10 Gbqs data rates are not adequate to meet the continued requirement for expansion and scalability in the data center, thus technology evolves and standards are completed to define higher data rates such as 40/100G Ethernet. In the meanwhile the cabling infrastructures installed today must provide scalability to accommodate the need for more bandwidth in support of future applications. OM3 and OM4 multimode cabling solutions have been proven to be a cost-effective solution for 40G data center. Today’s article will make you familiarize with this new Gigabit Ethernet and OM3/OM4 cabling to help you smoothly upgrade to 40G Ethernet. Multimode fiber is more popular in data centers than singlemode fiber. Many people may know the reason—budget. Because the price of multimode fiber is typically much lower than singlemode fiber. 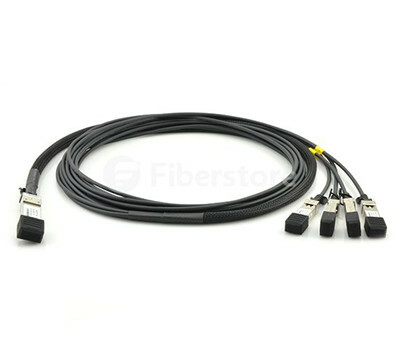 Additionally, multimode fibers utilizes the low cost 850nm optical transceiver for both serial and parallel transmission. While singlemode fiber uses the expensive 1310nm and 1550nm transceiver and duplex fiber wavelength division multiplexing (WDM) serial transmission. Therefore, most data center designers would choose multimode fiber for 40/100G transmission. 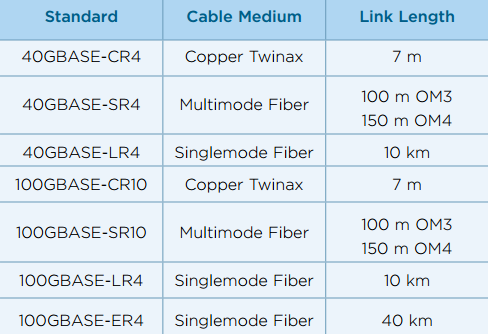 There are four common types of multimode fibers available in the market—OM1, OM2, OM3 and OM4. Recently OM3 and OM4 cables are gradually taking place of OM1 and OM2 multimode cable. OM3 and OM4 are laser-optimized multimode fibers with 50/125 core, which are designed to accommodate faster networks such as 10, 40 and 100 Gbps. Compared with OM1 (62.5/125 core) and OM2 (50/125 core), OM3 and OM4 can support high data rate and longer distance. This is why OM3 and OM4 is more popular in data center. The Institute of Electrical and Electronics Engineers (IEEE) 802.3ba 40G/100G Ethernet standard was ratified in June 2010. According to this standard, it includes detailed guidance for 40/100G transmission with multimode and singlemode fibers. But the standard does not have guidance for Category-based unshielded twisted-pair or shielded twisted-pair copper cable. 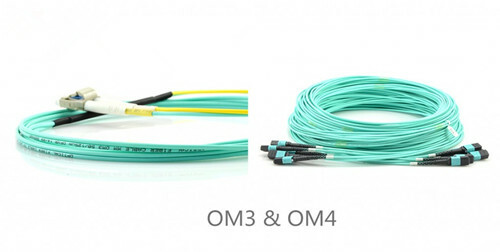 OM3 and OM4 are the only multimode fibers included in 40/100G standard. Because multimode fiber uses parallel-optics transmission instead of serial transmission due to the 850-nm vertical-cavity surface-emitting laser (VCSEL) modulation limits at the time the guidance was developed. Compared to traditional serial transmission, parallel-optics transmission uses a parallel optical interface where data is simultaneously transmitted and received over multiple fibers. Table 2 shows the IEEE standards for 40 and 100 GbE. The 40G and 100G Ethernet interfaces are 4x10G channels on four fibers per direction, and 10x10G channels on 10 fibers per direction, respectively. For 40GBASE-SR4 transceivers, it utilizes multimode fiber for a link length of 100m over OM3 and 150m over OM4. QSFP-40G-SR4 is Cisco 40GBASE-SR4 QSFP+ that can both operate over OM3 and OM4 cables to achieve 40G connectivity just as FTL410QE2C. As noted before, OM3 and OM4 can meet the requirement for 40G migration cabling performance, that’s why they are being widely utilized in 40/100G migration. But OM3 and OM4, which is better for your infrastructure? There is no exact answer to this question as numerous factors can affect the choice. The working environment and the total costs are always the main factors to be considered when selecting OM3 or OM4 multimode cable. OM3 is fully compatible with OM4. 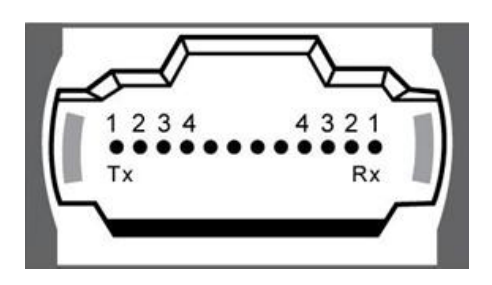 They use the same optical connector and termination of connector. The main difference between them is in the construction of fiber cable that makes OM4 cable has better attenuation and can operate higher bandwidth at a longer distance than OM3. On the other hand, the cost for OM4 fiber is higher than OM3. As 90 percent of all data centers have their runs under 100 meters, choosing OM3 comes down to a costing issue. However, in the long term, as the demand increases, the cost will come down. OM4 will become the most viable product in the near future. No matter choosing OM3 or OM4 for your infrastructure, 40G migration is in the corner. OM3 and OM4 multimode cable featured by the high performance and low cost are the perfect solution for 40/100G migration. Fiberstore is committed to provide the best-service and high-quality products to customers. Our comprehensive range of products in OM3 and OM4 offer customers the ability to create the optimal network. For more information, you are welcome to contact us. This entry was posted in Multimode fiber cables and tagged 100G, 40G, Cisco 40GBASE-SR4 QSFP+, data center, FTL410QE2C, multimode fiber, OM1, OM2, OM3, OM4, QSFP-40G-SR4, singlemode fiber on April 1, 2016 by Angelina.Li. In today’s server networks, 40GbE has become commonplace and has gradually taken over multiple 10GbE links to each server. Installation of 40GbE devices in the field will be a requirement for customer service and reduced operating costs. So are you ready for embracing 40GbE era? But how should the network prepare for delivering 40GbE to servers? The core of the 40GbE networking, just like the 1GbE or 10GbE networks, is a pair of transceiver modules connected by optical patch cables. Thus the issue here is to pick the right 40GbE optical devices for your network server. 40G optical transceiver modules has several form factors—CFP (C form-factor pluggable) transceiver, CXP transceiver form factor and QSFP/QSFP+ (quad small-form-factor pluggable) transceiver. 40G QSFP modules recently gain more popularity on the market as a result of its small size and high performance. Thus selecting 40G QSFP modules is a cost-effective solution for your 40GbE network server. QSFP is a compact, hot-pluggable transceiver used to plug into network servers, interface cards or switches. It provides four transmit and four receive lanes to support 40GbE applications for multi-mode and single-mode fiber and copper today. A variety of QSFP transceivers are available on the market, such as QSFP-40G-CSR4, QSFP-40G-PLR4, 40GBASE-PLRL4, QSFP-40G-SR4, QSFP-40G-LR4, etc. 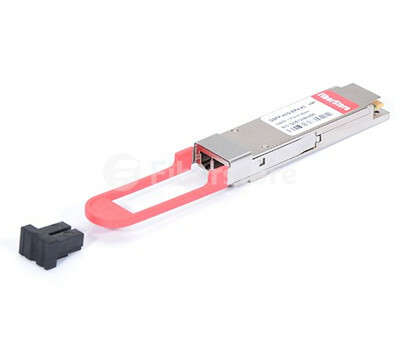 Take QSFP-40G-ER4 (see in Figure 1) as an example, it is the compatible Cisco QSFP-40G-ER4 QSFP modules that extend the reach of the IEEE 40GBASE-ER4 interface to 40km on single-mode fiber. The standards for 40GbE have been around for more than 2 years, and a number of routers, switches, and network cards have already operated at this speed. 40GbE cabling is also an important segment of upgrading your network. As we know that the most cost-effective cabling for both 10GbE and 40GbE is the direct attached cable (DAC) type based on twinaxial cabling. Such cables are based on copper and have transceivers directly connected to each end of the cable. 40GbE uses the slightly larger QSFP transceivers, which internally are made up of four 10Gbit/s lanes. DAC cables exist in lengths up to 10 meters, but the price increases substantially when the cables get longer than 3 to 5 meters. When longer runs of 10GbE or 40GbE than 10 meters are needed, fiber cabling and separate transceivers are the only option. 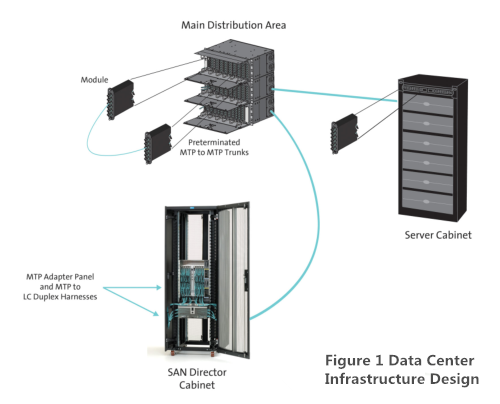 Active optical cables can achieve high data center over long reaches. In addition to achieving longer reach, the lower weight and tighter bend radius of AOCs enable simpler cable management and the thinner cables allows better airflow for cooling. But the cost of each transceiver is usually several times that of one DAC cable. Constraints like that are important to take into account when designing a data center network. Figure 2 shows a compatible Cisco QSFP-4SFP10G-CU3M QSFP+ to 4SFP+ Passive Breakout Copper Cable. 40 GbE will arrive for Top of Rack solutions in 2016. Switches in the campus backbone and aggregation layers should be ready for replacement/upgrading in 2016 to support 40GbE. Do not install any cabling in your data center or campus backbone. 40GbE uses 8 fiber cores for multi-mode and 1 pair for single mode. The cable will be OM4 although OM3 will have shorter distances. Provision the least amount of cable until new cabling solutions arrive. Spending money on expensive 10GbE switches will be wasted as they are likely to be replaced in 2016 with 40GbE. Most server people are already deploying/asking for 4x10GbE per chassis and it probably be cheaper to use a 40GbE QSPF than four 10G SFP modules in two to three years time. Believe it or not, the 40 Gigabit Ethernet era is already upon us. Therefore it is essential to make yourself well prepared for the incoming big data age. Over these years, Fiberstore has built a good reputation for uncompromising product quality, reliability and technical innovation. We offer a broadest portfolio of optical devices on the market today. For more detailed information, please contact us directly. This entry was posted in Fiber Optic Assemblies and tagged 40GBASE-PLRL4, 40GbE, AOC, Cisco QSFP-4SFP10G-CU3M, DAC, QSFP Transceiver Modules, QSFP-40G-CSR4, QSFP-40G-ER4, QSFP-40G-LR4, QSFP-40G-PLR4, QSFP-40G-SR4, Server on January 23, 2016 by Angelina.Li.